If you roll your eyes every year at the wodges of pallid, soggy stuffing that are scooped from the inside of the Christmas turkey, here is a recipe I think you'll love. 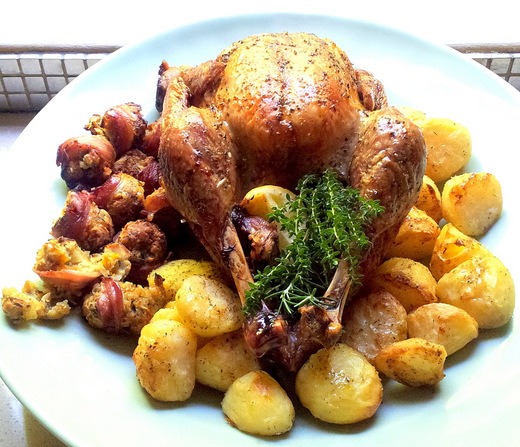 Crunchy macadamia nuts, fresh herbs and little nuggets of apricot mebos are combined with bread crumbs, then rolled into balls, wrapped in bacon and roasted alongside the Christmas gobbler to make a stuffing everyone will want to eat. 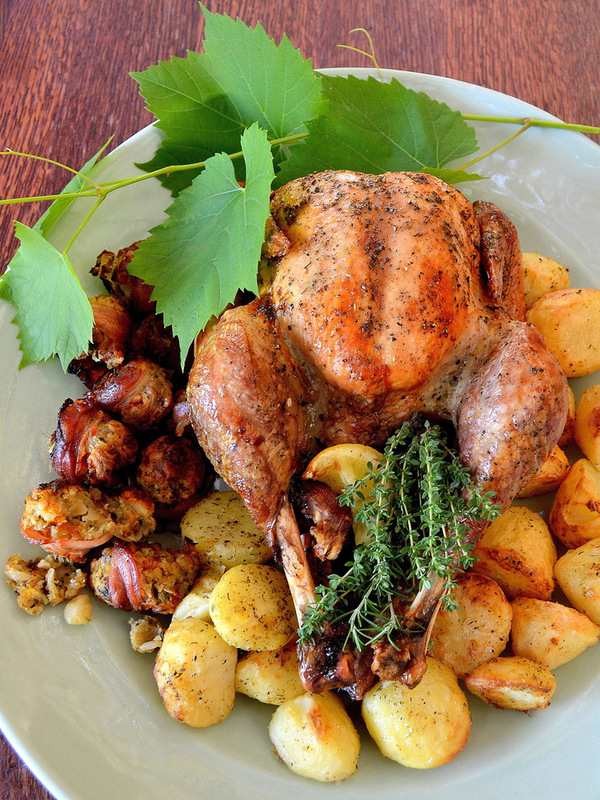 rosemary will transform a humdrum supermarket turkey into a feast. This beautiful platter was made by my uncle David Walters. I'm not a huge fan of turkey, but every year I dutifully stuff and roast a big bird for my extended family's Christmas Eve dinner, partly because it's become a minor tradition, pleasing the British-born members of our clan, but also because there's a lot that pleases me about carrying a big golden bird to the table, where it can roost proudly alongside rustling roast potatoes, jug of gravy and several trayfuls of sizzling bacon-wrapped chipolatas. There is something faintly ludicrous about roasting a turkey and all its lovely trimmings in the singing heat of a South African December night, but I don't care, because it's part of the madness I so love about the festive season. The turkey is always eaten in a desultory sort of way, the bacon-wrapped porkies being the star of the show, and hardly anyone eats the stuffing. I can understand this aversion. No matter how carefully you season and flavour a stuffing, it's essentially still a ball of bread bound with egg and steamed in the cavity of a pre-frozen turkey of dubious quality. 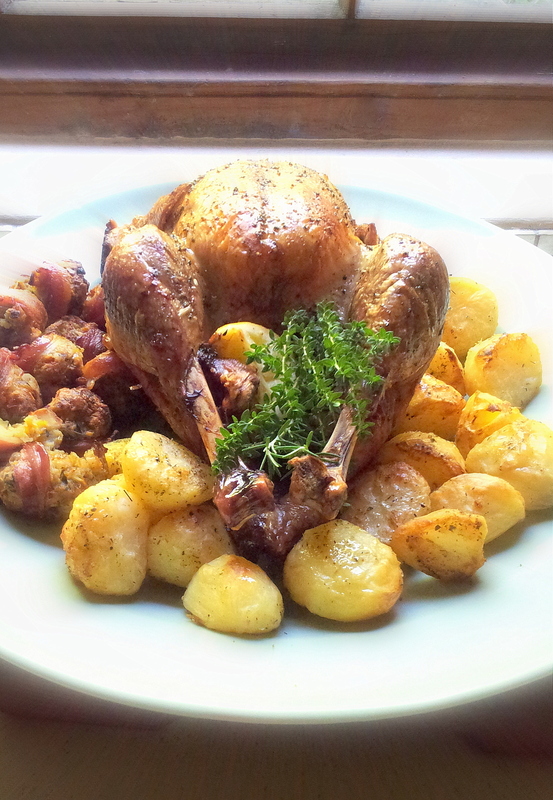 There are those who argue that cooking stuffing inside a bird helps to infuse it with a turkeyish flavour, but there's not much flavour in there to begin with. Why? Because we can't get luscious, plump, fresh free-range turkeys in South Africa, and because no amount of brining, basting, barding and larding will make the slightest difference to the flavour of a factory-reared bird. Even more important: cramming flavoured bread crumbs into an inferior turkey will significantly slow down the cooking time, resulting in sawdusty breasts and bone-dry wings. So, the solution, if you'd like a passable Christmas turkey: roast it fairly quickly without stuffing (but with plenty of fragrant aromatics such as lemon, garlic and herbs in the cavity) and serve it with these crunchy little balls of delight. You can make this stuffing, and wrap it in bacon, the day before your feast, and then simply sling the balls into the oven towards the end of the turkey-cooking time. Look out in the supermarket for unsugared mebos, which is made from dried, salted apricots. It has a powerful tart-sweet flavour, so don't be tempted to use too much of it. If you're not in South Africa, use good dried apricots instead - see recipe below. If you'd like to try another sort of stuffing, you'll find links to three more of my festive recipes at the end of this blogpost. Heat the oil in a large pan and sauté the onion over a medium-low heat for 4-5 minutes, or until it is soft and just beginning to turn gold. Remove the pan from the heat and stir in the bread crumbs, mebos, garlic, mustard, thyme, sage and lemon zest. Now prepare the macadamia nuts. Put them in a food processor fitted with a metal blade and push the pulse button quickly a few times, just enough to process them to a mixture of coarse crumbs and some bigger chunks the size of frozen peas. If you don’t have a food processor, chop two-thirds of the nuts very finely, and bash the remaining third into big bits using a rolling pin. Stir the nuts into the stuffing mixture along with the beaten egg and mix thoroughly and gently until everything is just clinging together in a large, soft clump. Season to taste with salt and pepper. At this point, it’s a good idea to take a good pinch of stuffing, press it lightly into a miniature patty and fry it on both sides in a little hot oil until gold. Taste the stuffing, and perk it up with more salt and pepper if you think it needs it. Pinch off large pieces of stuffing – each about the size of an apricot - and gently roll them between your hands to form balls.Cut the bacon rashers lengthways into two long, narrow strips. This is easiest to do using a very sharp pair of scissors. 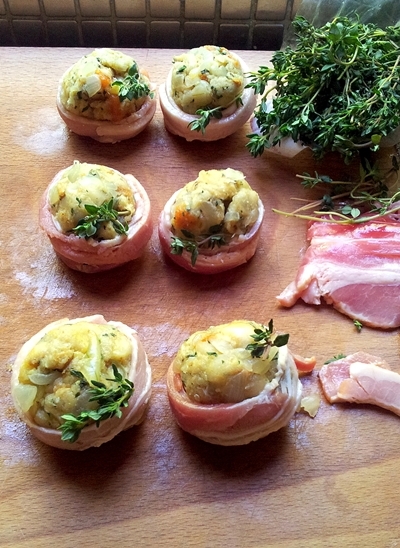 Wrap a length of bacon around the ‘waist’ of each stuffing ball, and press it down gently. Bake the stuffing balls along with your roast potatoes and turkey at 180 ºC for about 35 minutes, or until the bacon has crisped and the stuffing is golden and crunchy on top. Watch them closely, as they burn fast. Makes 12 balls. Double this quantity if you are roasting a giant bird.